Knoco stories: What does a merger do to communities? What does a merger do to communities? Looking through the archives on the train this week, I found a record of what happened to Communities of Practice after the BP Amoco merger in 1999. This is a useful case history of the effect of mergers on communities. Both BP and Amoco were operating with communities of practice, and many of these communities overlapped. 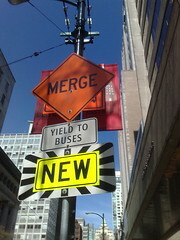 So what was done to merge and combine them? Well, to be honest, it was not handled systematically or strategically at the time, and was really left up to the discretion of the individual communities. However bear in mind that the BP KM team had been disbanded already, and that communities of practice were still a new concept, and their vital importance to organisations was not fully recognised. The community model survived, however, and the BP technical director introduced the BP community model to the new business leaders after the merger. The different business streams carried forward the model in slightly different ways, so the communities did not all look the same or work quite the same. Initally there was a honeymoon of 3 months when people made a great effort to collaborate. But as the pressure came on, community collaboration started to suffer, and people reverted to their own personal networks and their old, pre-merger communities. There was a hiatus in workshops and conferences, exacerbated by travel restrictions. New communities created after the merger had buy-in across the organisation, but some of the older ones became more like "old boys clubs", and getting the different communities to let go of their own tools/techniques and to adopt a common set was a real issue. Eventually the communities were merged, but not until after a hiatus in activity in many cases. - what happens to communities of practice when there is a de-merger or spin-off ? Very interesting KerrieAnne - what happened to thos fragmented CoPs? Did they survive? Were they damaged in the long term? Did they still link up "off the radar"?